Somebody remember Lost in Space 1998? In this movie a family enters into the future through a time blob. And inside the blob they find another blob with much far future. I think, AC can have same idea. We have 2 time lines. Note: I supporter of parallel dimensions (time lines) for time traveling. It's much logical theory. In the indefinite past. A true genomodified Engineer create/upgrade a life on the Earth. Engineers have come to Earth many times. 2093-94. Prometheus expedition on LV-223. Discover Engineers builds and meet with a true biomechanical Engineer. Show and David go to Paradise. 2094. Neutrino burst sent the Juggernaut with David and Show into the past. David doesn't know about time travel and created a second time line. David destroy the true "primitive" Engineers - they just started using genomods and choice of their people create a life and humans on Earth. Still don't have biomechanical parts and never come to Earth after humans creating (no rock-paiting with LV-223 coordinates). He still think that he placed in 2094. But Engineers erased in this time line and builds on LV-223 too. 2104. In the first time line. Covenant go to Origae-6 but also gets into the past, in David's second time line. "How we can miss Planet 4 when scanning?" Obviously! Planet 4 is definitely dead planet in ~2104. Another rock in space. But not in the past! After all David get the Covenant and go to Origae-6. Maybe he send message to WY, but WY and human civilization don't exist yet. In the indefinite past. David arrives on Origae-6 and create his own world. Time runs, David waits. But no one arrives on Origae-6. David's civilization have a better progress (using alien-dna) and finally start fly to space. They have a strange sacrifice rituals with xenomorphs. because this need for many reasons. They find the Earth with primitive humans and David finally knew about time travel. He decides to destroy humans at the Dawn of their civilization. David very proud his latest achievement - the restored Engineers ship. Bio-Juggernaut. David himself has many biomods and become a biomechanical life form - inspired by the last Engineer from LV-223. And he go to his secret places - Planet-4 for Show grave and he grab the leavings Black Goo. And after - LV-223 for Black Goo as easy path to destroy humans. But it's just a rock. Just for experiment David used last drop of Black Goo (from Planet-4) on alien eggs. But mutant facehugger attack David and Bio-Juggernaut crashed on LV-223 (crashed Engineers Juggernaut never exist in this time line). David's race don't know about his destiny and they don't know about Planet-4 or LV-223. They stay on their planet and continue use the biomods. Aliens go down in history. 2122. Nostromo find the Bio-Juggernaut (we know as Derelict) on (in second time line) LV-426. After 2122. Mankind find Origae-6 and alien civilization - we know them as... Arcturians! Simply put - Prometheus and AC with Alien Quadrilogy is a different dimensions. Prometheus have Engineers, Deacon/Deacon-like creatures, LV-223, and crashed Juggernaut, Planet-4 - who knows, in this time line Engineers never be destroyed... by David at least. AC with Alien Quadrilogy have Space Jockey (David corpse), Xenomorphs, LV-426 (=LV-223), and crashed Derelict, Planet-4 - dead rock. And as we know - the story of Alien ends in AR. But Prometheus time line just starting to live and humans still can meet the Engineers and many unknown creatures. 49 Responses to Time travel in AC2? No! Already in AC. Mad explanation. I love things to do with time travel & time travel elements & don't have a problem with time travel being included within the Alien universe as its unaviodable to get around the subject without facing it. Many frown about time travel being included in the Alien-verse but frown-or-not, it does exist, its a narrative concept that has to be recodnized that may have equal narrative implications for the characters We love. Provided the internal logic for using time travel within the Alien-verse is solid & works, I'm all for it! Well, when you think about it, what's the difference between Ripley being in cryosleep for 57 years set against travelling forward in time 57 years? It achieves the same end result & is really no less plausible as a plot device. If the logic & context work within the story then it needn't be a problem! I always wondered whether the Space Jockey in some-way-or-another is one of our beloved characters whether good-or-bad that some-how ends-up there as that "thing" sitting in that seat... & always wondered if time travel or time dilation in some way had a hand in that Ship/Juggernaught crashing/force- landing & becoming the Derilict that We all have become fascinated with. (i.e.) It could have been a transformed David, or a true life form that is either: "fossilized" OR... OR "petrified" in it's place. I think of how stalectites & stalegmites create themselves with water droplets over time & would accept that in some way Ripley, David or a Life Form of unknown origin either crash landed thousands of Years ago or they went back in time to end-up being the one who actually crash-lands thousands of years ago... OR... We have yet to actually encounter the REAL Space Jockey race of aliens who wind-up crash-landing thousands of years ago do to the consequences of time travel. Would LOVE THAT!!! Even when you consider how the Juggernaut travels in Covenant, it appears to jump through space, before decelerating over the Engineer city. Could these ships have the capability to demateralize? It's exciting to ponder, but I kinda hope it remains a mystery! & I do like a REAL-GOOD mystery too! Granted, you don't always need time travel to explain-away everything to get you out of a narrative corner you may write yourself into (and I mean "You" in the general use of the word regarding writers & creatives). I would be just as happy with the fact that it crash landed or was force-landed down onto LV-426 hundreds, if-not, thousands of years ago by conventional mechanical failiure means of explaining it, breakout of a facehugger attacking the pilot & unable to maintain control from being attacked by the thing in the first place. 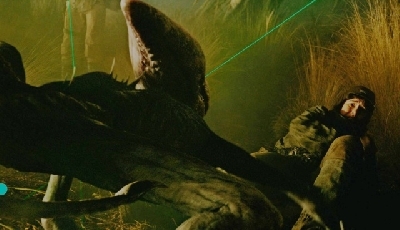 Or, was attacked 24-to-48 hours earlier & because their size is so gigantic, as compared to a Human, it took longer for the hatching-out symptoms to show up as opposed to how it showed up much quicker regarding Kane's symtoms from Alien as He, as a being, was much smaller in stature/size. Would like something to do with time travel to be introduced into the Alien-verse that hasen't been seen onscreen already, like discovering the Enginneers were themselves trying to tame/master time travel if They hadn't already otherwise how do they get around the local area of the universe without understanding & conquering at least the basic "rules" of time travel/dilation/relativity/FTL/quantum concepts/vacume energy/wormholes/inner-space vs outer space/time light curves, etc. Notice how futuristic (for want of a better word) weaponry or concepts have been avoided for the most part. I think Ridley is afraid they would appear too Trekkish. The Alien-verse tech has always been rooted in plausibility. When, with the right minds working on it there could be some mind bending tech. The Juggernaut had those pinky coloured blobs encased within the control console. Major Noob/Aorta speculated that they were some sort of brain! Cool, weird, bio-organic powered tech, something that could best be described as totally Alien in nature, that you cannot wrap your head around, totally epic! Yeah and where did it come from? I want to ask Ridley or someone in the know about that. It's freakishly awesome! That's why I love Prometheus, to me it really appeared to be going somewhere totally off the wall. It had those psychedelic elements. Knowing Ridley, those brains were probably inspired by Forbidden Planet or some such. I'm going to research more on that Lone! Well, when you think about it, what's the difference between Ripley being in cryosleep for 57 years set against travelling forward in time 57 years? This is the main thing. Time travel firstly - it's a path to the past. Path to the future can have any form. (Cryo)sleep, traditional time travel (like teleportation) and other. But I always thinks that (Cryo)sleep - it's not a time travel. A man, who go live in the forest in Age of horses and go back in Age of vehicles - time traveler? No. I think - Time Travel idea is that a man doesn't exist in this period. As in Back to the future: Marty now → pew → teleportation → Marty in future. marty doesn't exist in teleportation period. But sleeping man exist. Yes, they can go to time travel point and gets into the past for upgrade their race. Again and again. Yeah - it's all be in another time lines/dimensions, but - sacrifice it's a part of Engineers culture. (i.e.) It could have been a transformed David, or a true life form that is either: "fossilized" OR... OR "petrified" in it's place. I think of how stalectites & stalegmites create themselves with water droplets over time & would accept that in some way Ripley, David or a Life Form of unknown origin either crash landed thousands of Years ago or they went back in time to end-up being the one who actually crash-lands thousands of years ago... OR... We have yet to actually encounter the REAL Space Jockey race of aliens who wind-up crash-landing thousands of years ago do to the consequences of time travel. Would LOVE IT!!! Haha. I imagine this situation without time lines, but with time circle. 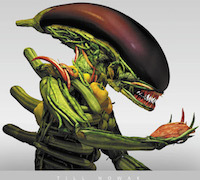 David or someone else created xenomorphs and Bio-Juggernaut with inspiration from Engineers. You know: U-form, Elephant-like suit. And then he go back in time and crashed on LV-426. After all - his remains will be finded by young Engineers race. They build a base on LV-223 and start exploring Derelict. They copy suits, ship form, Engineers recycle xenomorphs in Black Goo. And again - mankind expedition find them and copy, create xenomrophs from Black Goo and go back in time... endless. Don't need apologize. I alway like technical aspects. And Forbidden Planet, of course. I think AC and FP similar in many ways. Mind-Melding. Yes and more. Something like neuro-interface, when the Pilot and the Ship become one. Extended life form. The Pilot literally became a ship! 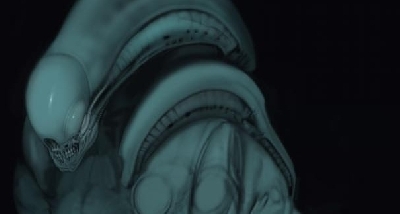 I'd love it if the brains belonged to Giger's Ganesha Space Jockeys! 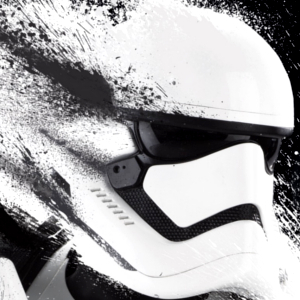 In the past we've discussed the prospect of the LV-223 Engineers/Clones/Hybrids using stolen technology. Stolen from the Ganesha truckers or adapted from that tech? It's a great way to include the original Jockeys, even if they've been wiped out & the good old Derelict Pilot could remain sacred. He was on a mission to wipe out those Engineers, or as I have always felt, he either sacrificed himself or became infected when an attempt to quarantine the cargo went wrong & he had to land or scuttle the ship. Or....the Engineers used the Jockeys, who were actually melded to their ships, to move unstable cargo? 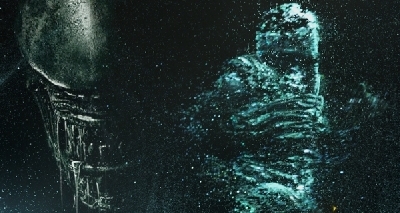 When I saw the Space Jockey in Alien it was an enigma to Me for a long time. Then, the Aliens vs Predators comics came out in the 90's & they showed the Derilict alien race: the Mala'Kak & they then came across to Me like a sacred race almost like benevolent sentient giant cow's of the Galaxy. So for a time they seemed to have this galactic wise old elephant presence about them, not just because of the trunk, but that in part factored into it but a race that seemed gentle, pure & genuine. But then it feels as though it was being decieved & cheated, its intelligence being insulted so it lashed out & crushed the jumped-up petulant little Human usurpers. Smashing up all in "His" path because it did come across to Me as an amophic Male rather-than-female. I always looked at them as ancient benefactors whom have long bouts of bear-like hibernation which is why they possibly live for so long. That, to Me, served as the insperation for the Engineer actions in Prometheus to grab hold of David & rip His head from his torso. But what really strikes-home to Me now in hindsight when Ripley says the line about the message: "It looks like a warning", I now see that whole scene regarding the Space Jockey just that, a warning for any species recieving the broadcast because now, I view "Him" sitting "embossed" within that chair as THE LAST of His entire SPEICIES! His ENTIRE RACE! His ENTIRE CIVILIZATION!! The last of His ENTIRE KIND!! That's how I view Him now & that could be a possible window into His thinking as to why He ended-up "marooned" upon LV-426, what must have gone through His mind knowing that He could possibly be last of His civilizations ENTIRE EXISTANCE!! That His mere prescence there marooned upon this crappy inhospitable world & his actions that lead Him to be there in that condition is the SUM TOTAL now of His entire race having EVER existed at all!! THIS state He now found Himself in was ALL He had to show for the sum total of His life choices & actions! & to now know that at the point of death perhaps a flash of His corpse's destiny came to Him briefly & He some how possibly knew & was certain in the knowledge that His expended, used-up husk-of-a-body was going to languish here, in this blighted HELL of His own making for centuries... Tens-of-THOUSANDS of years even... THOUSANDS!! Like Ripley emphasises. It makes Me think that in that moment He was overcome with an incomprehensible sense of sadness & loss for His civilization having ever been remembered for even existing at all!! What could be ultimately sad was that perhaps He was the last custodian of his entire races archives, & history &, now that entire length/breadth of cultral history is lost for eternity. The galaxy/universe would not even know or quickly forget that He & His race ever existed at-all!! The last of His SPECIES!! He was probably like the self-sacraficing Ripley of His own kind, doing some last-ditch noble act as She did at the end of Her life's journey at the time during the end of Alien 3. Maybe in that moment of Hubris "He" (maybe "She", We don't fully know as yet but I'm going with a He) found some selmence of inward nobility in His sacraficing of Himself for the betterment of all civilization kind scattered across the Galaxy. Or He was a noble kind & did a dutiful act of custodianship to the Galaxy as one of its noble Sheperds & duty-bound as a galactic Steward. He could have been truely noble in His actions. So bringing the topic round full-circle His (i'm going to call it!) "fossilized/petrified" remains serves as a haunting epitaph to His cultures entire existence or quite possibly having ever existed at all! He now serves as a time capsule of sorts being one quite possibly of His entire own making. A living-Dead reminder to Human-kind & Ripley got it when She said: "a warning" because He serves as a warning to any civilization dabbling in things You're not prepared to reap the consequences of much like Dr. Frankenstein as You could soon find Yourself the ABSOLUTE LAST of Your kind looking back & wondering how the Hell did I & the rest of My kind get here!! They called Mala'kak. Yeah, really good race. THAT'S IT!! The Mala'Kak! GREAT! Thanks Bro! If You are a Bro! I'll correct my spelling above. I added more text to it now too Man! Lost in Space is a great example of time travel as an unintended consequence of interstellar space travel. "They find the Earth with primitive humans and David finally knew about time travel. He decides to destroy humans at the Dawn of their civilization. David very proud his latest achievement - the restored Engineers ship. Bio-Juggernaut. David himself has many biomods and become a biomechanical life form - inspired by the last Engineer from LV-223." That sounds great to me Leto and I'm not against the time-travel in the Alien universe...it's certainly in the comics, below. The below video incorporates "far-out" items from the comics, film, promotion including time travel in an attempt to tease out who the Space Jockey could be. The above room, to me, is a fascinating part of the story because we have no idea how old, how large, it seems to be underground and it is in the novel, etc....all of which could have been build in the past by current characters and events with time travel added. JPL mentioned it too here and cited the neutrino burst as a potential consequence of time travel. 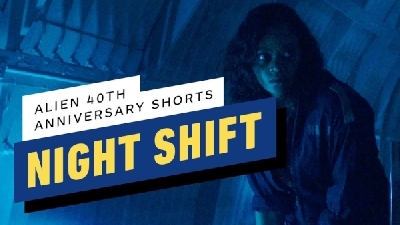 I'm with BigDave on this being an infrequent, or "one-off" event though because it may not mesh well if it is a frequent occurrence and a main part of the story (such as Terminator) while all the other Alien films have no reference to it. If the Engineer tech can fold space then it's not too much of a stretch that they could fold time as well. Why sleep such long periods of time if you can just time travel and not use the resources to maintain engineers thousands of years? To reconcile this...the energy used to fold time and space may just be too large and the Engineers may save resources by sleeping. "It could have been a transformed David, or a true life form that is either: "fossilized" OR... OR "petrified" in it's place." That would actually be pretty cool HYPERNOVA and it would certainly make the "what the hell?" list. INGENIERO... I like the idea that even in a far advanced future & an advanced race, THEY are still trying to reduce their temporal carbon footprint upon the fabric of space/time & that's why they limit the amount of times they "fold" space juxtaposed with time spent in stasis within their hibernaculum. A GREAT thought experiment/idea INGENIERO! On the other, I would still like to hold-out that it is a lost alien being of a race We have yet to see the origins developed more. It would be cool that somehow the Engineers stumbled upon the last vistages of the Mala'Kak race a very long time ago, long before the Derilict crash-landed & copied it/intergrated it, adapted it, incorperated it, absorbed it into their own as the Romans did for centuries as it advanced out & came into contact with new/unknown peoples of Europe. In 2094 David and Shaw, and in 2104 the crew of the USCSS Covenant was both struck by the same neutrino wave, which sent them back in time to before the Engineers became bio-mechanical. Following which David wiped out the Engineers and after the events of Alien: Covenant he used the specimens he re-created on "planet 4" when the Covenant arrived at Origae 6 to re-create the Xenomorph and to transform a Juggernaut into a bio-Juggernaut capable of carrying the Xenomorph eggs before piloting the bio-Juggernaut and, after falling victim or sacrificing himself to his cargo, landed on LV-426 and sent out a beacon warning any and all away, and where thousands/millions of years later David (AKA the Space Jockey), the bio- Juggernaut (AKA the derelict), and his cargo were discovered by the USCSS Nostromo. All of the above is what is known as a predestination paradox, a paradox that is the epitome of, a perfect example of a causality loop (see the link in my signature) - which is only possible using causal time travel. Alternate or Parallel timeline/reality time travel is theoretically free of paradoxes. For example, if I was to travel back in time to kill my father before I was conceived (a simplified version of the grandfather paradox) using causality time travel I would travel back into my own past and undo my existence, hence the paradox. But if I did the same in using alternate/parallel reality time travel I would travel back into the past of another reality and kill that realities version of my father, thus undoing the possibility of an alternate version of myself in that reality. The problem with alternate/parallel time travel is that it requires the existence of a multiverse of infinitely generated and generating parallel realities, which by their very nature seem like an impossibility - what purpose would so many universes serve. I think there are some good ideas there LETO... now i dont want to come across bad here.... i like some of the ideas, i am just not a Fan of using Time-Travel thats just my op pinion and mainly because it could open up a can of WORMS no pun intended... and give the Studio a chance to change things like with Terminator. I think it would depend no HOW the Time-Travel is Executed, and so a ONE-OFF Event.. yeah i could buy that... say some Event that Tears a HOLE in Space and Time.... i was thinking this Solution for LV-223, that it gets Destroyed but this Causes a Temporary Tear in Space and Time, sending the Derelict back Thousands of Years and then Crash-Lands on LV-426 and then the Tear in Space closes. I think as long as we dont explore Time-Travel as a Technology of the Engineers, because we could ask WHY not go back and Undo Mankind before we was created? I know i have bashed the Changes that Forced Prometheus to have to connect to ALIEN and the Xenomorph, which i dont mind, its just as a result it had reduced the Potential for Prometheus 2 to go off on a expanded Spin-Off. In part i felt Blomkamps Alien 5 also had some part to blame, as Fans got excited at the Prospect of a more ALIENS kind of Flick to Bring the Gang Back! Sorry for going OFF-TOPIC... a little... but i think as i suggested with explaining WHY they never go to LV-223 in the ALIEN Franchise, because it gets Destroyed and this Sends the Derelict back in Time.... i FEEL that similar could work for Blomkamps Alien 5, if the Destruction of Hadleys Hope, Caused a Tear in Space that Caused the Sulaco to Split into TWO Alternative Time Lines. 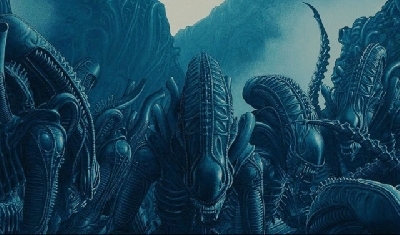 Fans could choose to IGNORE this reveal in Alien 5, and ignore the Project, some fans could choose to accept Alien 5 over Alien 3, while others could look at the Explosion Causing a Parallel Universe where Fans can Accept both Avenues. "After 2122. Mankind find Origae-6 and alien civilization - we know them as... Arcturians!" Thats a interesting idea... one that fits with the Topic i made in regards to Engineering/Evolution, i think thats a interesting take... and sorry if i had came across a bit Harsh in my Moaning about some of the Alien Fans, Expectations of movies having to be connected. I think the Arcturians! are something that also has never been explored that could be a avenue to expand upon..I had a idea on how to explore them myself... which connects the Engineers, and also reveals the Arcturian Pootang Parties are not entirely for the Leisure/Pleasure of Humans wanting some Fun/Action but that the Arcturians have a Agenda for the Sexual Relationship. I am not a FAN of bringing the Alien Franchise into having Paradox's i think its Unnecessary, but thats not to say that it cant be explored, as RS had said he feels the Franchise should be where a STAR TREK is.. and so excuse me for going OFF-TOPIC little..... the Prometheus Franchise opened up a WHOLE Universe of Possibilities, the Virtue that the Engineers Sat-Nav on their ships has other Galaxies means that the Alien Franchise could expand beyond a Star Wars or be similar... in a Galaxy Far Far Away! well we have to wonder what is in those Many Galaxies Far Far Away that the Engineers must have the ability to visit. so adding another Layer of Time-Travel i think is maybe Unnecessary, as far as a Technology at least. But thats just my opinion, it does-not mean exploring the idea of Paradoxes and Discussing them should not be interesting... I DONT own the Franchise after all.. so anything goes. A lot of Problems have occurred due to the Changes in Plot with Alien Covenant, its complicated things a little. They could have gone off to a FAR FAR world, and had clues to the Xenomorph without having to have David and Dr Shaw just end up on the Door Step to LV-223/426. Thus they could have retained the Space Jockey event as Ancient and Certainly NOT related to David's Experiments/Agenda. Its maybe a bit MOOT to discus the context of the Ancient Space Jockey, but that dont mean we cant discus it at all... Nothing is set in Stone until we see Davids Xenomorphs directly be placed on the Derelict. Ridley Scott had indicated the Space Jockey had done a Noble Act, and was Benevolent.... WHY would a Benevolent Race carry those Eggs? We cant deny the Aesthetic Connection between the Eggs and Derelict, This surely meant there was a connection.... but maybe not now things have been changed. We had RS confirm the Space Jockey Engineer Connection and those Eggs and LV-223 Connection even going as far to EXPLAIN the whole Event... what had been explained by RS and intended back in 2011-2013 has been changed now though. Regarding the Mala'Kak i am not a FAN of this concept, i felt they looked well a bit POOR.. to me i did think SKELETON when i First Saw ALIEN... in fact only when i got the movie on DVD and could pause and had also seen Magazines with Concept work, that then it CLEARLY appeared to me that what we had was a Space Suit! HR Gigers Concepts show the occupants are BALD and Humanoid.... again sorry for going OFF-TOPIC... our Engineers fit the BILL... just the Scale! I think while the Space Suit is what we have, it leaves it open to have the Space Jockey as a different Humanoid/Bi-Pedal Alien Race of Greater Stature. I said that I liked your theory, there were no sour grapes, my friend. I just clarified that your theory works better using causality time travel, and explained why. 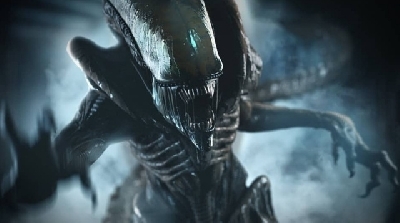 The arrogant statement was not aimed at you but instead at the narrative trope - having David (a human creation) be the SJ and also be the creator of the Xenomorph, and the Derelict means the term Alien is moot and it's all our fault, as in we are the center of the universe again, ergo arrogance. I'm sorry you misinterpreted my reply. Haha. Perfect. Two people in different time and places have one idea. I know the roots of this. This is more crazy disaster expalantion about AC and AC2 plots. I'm completely sure - I know the plot of AC2. I still prepared idea and collect information about... I say later. I'm sure - you will like this. It's a pity! I still have not read Life and Death. Great video! I add detailed commentary later. Well, without comics, I think that Engineers just can't. Time travel - not a technology, but random space anomaly - wormhole. And this is different between Alien-verse and Terminator-verse. It would be cool that somehow the Engineers stumbled upon the last vistages of the Mala'Kak race a verey long time ago, long before the Derilict crash-landed & copied it/intergrated it, adapted it, incorperated it, absorbed it into their own as the Romans did for centuries as it advanced out and came into contact with new & unknown peoples. Good idea - maybe Engineers find Derelict itself!